Krzysztof Penderecki (born November 23, 1933 in D?bica) is a Polish composer and conductor. His 1960 avant-garde Threnody to the Victims of Hiroshima for string orchestra brought him to international attention, and this success was followed by acclaim for his choral St. Luke Passion. Both these works exhibit novel compositional techniques. Since the 1970s Penderecki's style has changed to encompass a post-Romantic idiom. He has won prestigious awards including Grammy Awards in 1987 and 1998 and 2001, and the Grawemeyer Award for Music Composition in 1992. As well as the works already mentioned, his compositions include four operas, eight symphonies and other orchestral pieces, a variety of instrumental concertos, choral settings of mainly religious texts, as well as chamber and instrumental works. After taking private composition lessons with Franciszek Skolyszewski, Penderecki studied music at Jagiellonian University and the Academy of Music in Krak?w under Artur Malawski and Stanislaw Wiechowicz. Having graduated in 1958, he took up a teaching post at the Academy. Penderecki's early works show the influence of Anton Webern and Pierre Boulez (he has also been influenced by Igor Stravinsky). Penderecki's international recognition began in 1959 at the Warsaw Autumn with the premieres of the works Strophen, Psalms of David, and Emanations, but the piece that truly brought him to international attention was Threnody to the Victims of Hiroshima (see threnody and atomic bombing of Hiroshima), written for 52 string instruments. In it, Penderecki makes use of extended instrumental techniques (for example, playing on the "wrong" side of the bridge, bowing on the tailpiece). There are many novel textures in the work, which makes great use of tone clusters. He originally titled the work 8' 37", but decided to dedicate it to the victims of Hiroshima. Fluorescences followed a year later; it increases the orchestral density with more wind and brass, and an enormous percussion section of 32 instruments for six players including a Mexican g?iro, typewriters, gongs and other unusual instruments. The piece was composed for the Donaueschingen Festival of contemporary music of 1962, and its performance was regarded as provocative and controversial. Penderecki's intentions at this stage were quite Cagean: 'All I'm interested in is liberating sound beyond all tradition'. This preoccupation with sound culminated in De Natura Sonoris I, which frequently calls upon the orchestra to use non-standard playing techniques to produce original sounds and colours. A sequel, De Natura Sonoris II, was composed in 1971: with its more limited orchestra, it incorporates more elements of post-Romanticism than its predecessor. This foreshadowed Penderecki's renunciation of the avant-garde in the mid-1970s, although both pieces feature dramatic glissandos, dense clusters, and a use of harmonics, and unusual instruments (the musical saw features in the second piece). Around the mid-1970s, while he was a professor at the Yale School of Music Penderecki's style began to change. The Violin Concerto No. 1 largely leaves behind the dense tone clusters with which he had been associated, and instead focuses on two melodic intervals: the semitone and the tritone. Some commentators compared this new direction to Anton Bruckner. This direction continued with the Symphony No. 2, Christmas (1980), which is harmonically and melodically quite straightforward. It makes frequent use of the tune of the Christmas carol Silent Night. Penderecki explained this shift by stating that he had come to feel that the experimentation of the avant-garde had gone too far from the expressive, non-formal qualities of Western music: 'The avant-garde gave one an illusion of universalism. The musical world of Stockhausen, Nono, Boulez and Cage was for us, the young - hemmed in by the aesthetics of socialist realism, then the official canon in our country - a liberation...I was quick to realise however, that this novelty, this experimentation and formal speculation, is more destructive than constructive; I realised the Utopian quality of its Promethean tone'. Penderecki concluded that he was 'saved from the avant-garde snare of formalism by a return to tradition'. 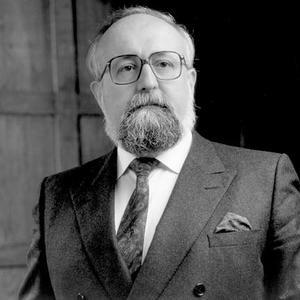 In 1980, Penderecki was commissioned by Solidarity to compose a piece to accompany the unveiling of a statue at the Gda?sk shipyards to commemorate those killed in anti-government riots there in 1970. Penderecki responded with Lacrimosa, which he later expanded into one of the best known works of his later period, the Polish Requiem (1980?84, 1993, 2005). Again the harmonies are rich, although there are moments which recall his work in the 1960s. In recent years, he has tended towards more traditionally conceived tonal constructs, as heard in works like the Cello Concerto No. 2 and the Credo. He conducted Credo on the occasion of the 70th birthday of Helmuth Rilling, 29 May 2003. In celebration of his 75th birthday he conducted three of his works at the Rheingau Musik Festival in 2008, among them Ciaccona from the Polish Requiem. In 2001, Penderecki's Credo received the Grammy Award for best choral performance for the world-premiere recording made by the Oregon Bach Festival, which commissioned the piece. The same year, Penderecki was awarded with the Prince of Asturias Prize in Spain, one of the highest honours given in Spain to individuals, entities, organizations or others from around the world who make notable achievements in the sciences, arts, humanities, or public affairs. Invited by Walter Fink, he was the eleventh composer featured in the annual Komponistenportr?t of the Rheingau Musik Festival in 2001. Penderecki received an honorary doctorate from the Seoul National University, Korea in 2005, as well as from the University of M?nster, Germany in 2006. His notable students include Chester Biscardi and Walter Mays. Penderecki has three children, a daughter from his first marriage, and a son and daughter with his current wife, Ezbieta Solecka, whom he married in 1965. Some of Penderecki's music has been adapted for film soundtracks. The Shining (1980) features six pieces of Penderecki's music: Utrenja II: Ewangelia, Utrenja II: Kanon Paschy, The Awakening of Jacob, De Natura Sonoris No. 1, De Natura Sonoris No. 2 and Polymorphia. The Exorcist (1973) features Polymorphia as well as his String Quartet and Kanon For Orchestra and Tape; fragments of the Cello Concerto and The Devils of Loudun are also used in the film. Writing about The Exorcist, the film critic for The New Republic wrote "even the music is faultless, most of it by Krzysztof Penderecki, who at last is where he belongs. "David Lynch has used Penderecki's music in the soundtracks of the movies Wild at Heart (1990) and Inland Empire (2006). Penderecki's piece, Threnody for the Victims of Hiroshima, was also used during one of the final sequences in the film Children of Men. Penderecki composed music for Andrzej Wajda's 2007 film Katy?, while Martin Scorsese's Shutter Island featured his Symphony No. 3 and Fluorescences.